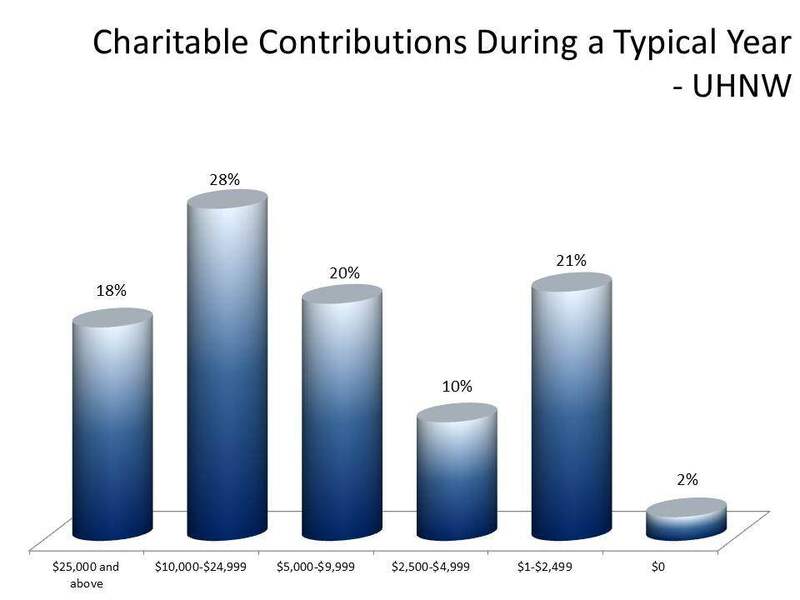 Changing the deductions for charitable contribution could take a bite out of what charities are receiving because wealthy Americans do contribute to charity. Ongoing research conducted by Spectrem Group of affluent investors from 2013 shows that 91 percent of Ultra High Net Worth investors with a net worth between $5 million and $25 million made charitable contributions in the 12 months leading up to the study. Among Millionaire investors with a net worth between $1 million and $5 million, 83 percent contributed, and 86 percent of Mass Affluent investors with a net worth between $100,000 and $1 million made contributions to charity as well. Seventeen percent of the Millionaire investors contributed between $10,000 and $25,000 to charity, as did 16 percent of Millionaire investors over the age of 64. Among UHNW investors with a net worth between $15 million and $25 million, 8 percent contributed between $50,000 and $100,000 to charity and another 12 percent contributed between $25,000 and $50,000. More than a quarter of all UHNW investors contributed at least $10,000 to charity, and among the youngest UHNW investors, who are under the age of 45, 24 percent contributed up to $25,000 and another 24 percent contributed up to $50,000. Since 2009, President Obama has included a provision in his budget to reduce the tax deduction for charitable contributions to 28 percent from its current high of 39.6 percent for the wealthiest Americans. The new provision would apply only to single income taxpayers making in excess of $200,000 and married couples with combined incomes above $250,000. From a government standpoint, the tax deduction reduction would boost revenues by $321 billion over the next eight years. However, advocates for charitable organizations say the change would reduce donations by approximately $9 billion annually. From an investor’s standpoint, charitable donations are a way to promote, protect or grow a cause that cannot fund itself. Tax deductions for charitable contributions make it easier for investors to give as a way to legally reduce their tax bite.